Once upon a time, during the belle époque in Paris, a short-lived film form called scènes de feeries, or fairy films, became popular thanks to the Pathé Frères company. Made to appeal to young and old alike, the films recreated the theatrical spectacles of the age in jewel-like colours. Fairy Tales: Early Colour Stencil films from Pathé brings the films to DVD for the first time, each accompanied by a newly commissioned soundtrack by recording artists from the leading experimental music label Touch. These gorgeous films feature fantastical settings, dancing girls, mythical beasts, supernatural beings and a plethora of stage tricks. Enhanced by the techniques of the then-new medium of film, they give modern audiences a fascinating glimpse into the magical world of the nineteenth-century theatre. Presented here with original hand-colouring, the new soundtracks, all by recording artists from the Touch label, feature contributions from such acclaimed composers as Chris Watson, BJ Nilsen, Hildur Gudnadóttir, Philip Jeck and Fennesz. Their music, at times elegant and playful, at times intense and challenging, combines with these beautiful images, in often surprising ways, to create a unique and unforgettable experience. 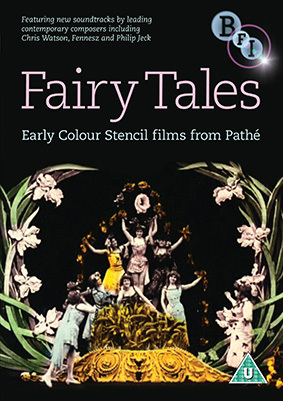 Fairy Tales: Early Colour Stencil films from Pathe will be released on UK DVD on 3rd December 2012 by the BFI at the RRP of £19.99.